Sun Wukong, the Monkey King, is a melee agility hero infamous for his trickery, deceit, and all around mischievous nature. Wukong is all about confusing his enemies and would-be pursuers, by leaping on top of trees and escaping in unexpected directions right after. This is done through his built-in mobility skill, called Tree Dance. Keeping with his treacherous and duplicitous nature, Wukong also has Mischief, an ability which camouflages him based on his surroundings. Should he activate the ability next to a tree, so shall he take that form. If he is to do so near a rune, he transforms accordingly. Though a seemingly useless ability on paper, Mischief actually causes Monkey King to become invulnerable for a split second, thus increasing his potential for escape by a small margin. When he is the one pressing the attack, however, Monkey King wields his magical extending bo staff, modeled after the Monkey King Bar itself. With his first ability Boundless Strike, he causes the staff’s reach to grow exponentially, dealing critical damage to all enemy units in a straight line in the process. His foes are also stunned by the impact, their spines broken from the force. Boundless Strike isn’t the staff’s only power, though—for Monkey King’s Jingu Mastery (a passive ability) enchants the weapon with lifesteal and bonus damage after striking an enemy hero at least four times. Once this power is brought out from the staff’s core, Wukong can apply its benefits onto Boundless Strike, thus increasing its lethal properties and the amount of health he gains. In order to get close to his prey, though, Monkey King must utilize his mobility. Fortunately, Tree Dance has a sub-ability called Primal Spring, which causes Wukong to leap down from his perch on high—dealing area of effect damage and slowing enemy units upon landing. The longer Monkey King is able to channel Primal Spring, the more damage it deals and the slower his targets become. Out of all his wondrous abilities, though, his ultimate skill Wukong’s Command stands out among the rest. After a short delay, Wukong’s Command summons a ring of soldiers that take after his form and image, surrounding the area and attacking foes who dare to enter or leave the circle. His clones take on his attributes, and apply any on-hit effects that Monkey King may have from items (excluding Basher and Abyssal Blade). Wukong’s Command allows Monkey King to control a sizable space during teamfights, constantly annoying enemy heroes with extra attacks and forcing them to make quick decisions on whether or not to leave the area. But even with his bag of tricks, Sun Wukong is not infallible nor invincible. Though he may be elusive, his ability to climb trees can also be his downfall—literally. Should the tree that Monkey King is perched on be destroyed, he crashes down to the ground with a thud—stunning him for four seconds. This, coupled with his natural fragility, can quickly spell his doom. He is also a slow farmer, having no flash-farming abilities aside from Boundless Strike—which has quite a long cooldown. This only makes the fact that he is an item-dependent carry even more of a problem, considering that he is typically unable to farm at the same pace as other carries with built-in farming accelerants. Due to the snail’s pace at which he farms, we do not recommend playing Monkey King as a carry from the start of the game. He is gimped severely without items, and struggles to build any without getting a head start somehow. Thus, we suggest playing him as a roaming position 3 or 4 hero, up until he is able to transition into a true core role through the gold and experience gained from ganking enemy heroes in the laning phase. Thus, his skill build will be tailored to this strategy. Tree Dance will be given first priority in this case, since it gives Wukong supreme mobility at no cost. With it, he can leap from lane to lane without showing himself to the enemy team, unless he happens to cross an area where they have vision in the process. Otherwise, the opponents will have to have flying vision over him in order to see him. Moreover, Tree Dance allows Monkey King to place wards in enemy territory without having to put himself at risk in order to do so—which can be a huge advantage for your team if they can capitalize on it. And so, we recommend taking Tree Dance as your first ability, followed by Jingu Mastery and Boundless Strike thereafter. All three of your abilities allow you to terrorize the lanes with ease and finish off injured targets from long range, so it’s important to get them all unlocked by Level 3. Tree Dance will then regain priority until Level 6, which is when you should take your first level of Wukong’s Command. Continue to gank the lanes as needed, investing into Boundless Strike as you go. Jingu Mastery should be the last ability that you max out, as it becomes more useful later in the game when you are able to purchase attack speed items. Wukong’s item progression should also follow the strategy laid out by his skill build—which involves purchasing cheap items that aid in roaming and ganking in the laning phase, then building pieces that help him transition into a core role. First off, you’ll want to get your hands on an Orb of Venom, which takes advantage of the fact that Monkey King actually has a ridiculously long attack range for a melee hero (300 units!). With it, you can slow your targets down in lane with ease, which also helps you build stacks on Jingu Mastery. This item was practically made for roaming Monkey King, and it doesn’t even cost a whole lot of gold to get. Afterwards, we recommend purchasing some Boots of Speed and a Blight Stone, which contribute more towards your roaming and ganking efforts thanks to the increase in movement speed and physical damage. The mid game is where things get a bit tricky. As your opponents gain more and more levels, their health pools will also start to grow. This presents a few problems while roaming, as your targets will take longer to bring down—thus slowing down your gold and experience gain as well. This is when Hand of Midas can come in handy, as it allows you to increase your farming pace by a flat rate while fights and gank attempts are scarce and/or not viable. It also gives you some bonus attack speed, which is always nice. Using the passive farm from Midas, you’ll want to start transitioning to your damage items. Echo Sabre is an excellent choice as a transitional pickup, since it grants you “artificial” attack speed with which you can quickly build Jingu Mastery stacks. The passive slow from Echo Sabre is also applied by your Wukong’s Command clones, which can be irritating to your enemies. Later on, a Black King Bar will become necessary, as Monkey King is a high priority target for stuns and disables. With it, you can stay comfortably within range of Wukong’s Command, while shrugging off any attempts to stop you from building Jingu stacks. Remember the Blight Stone from the laning phase? You can use that to build a Desolator, which not only helps you deal more physical damage with Boundless Strike, but also helps you take down towers. On the other hand, if you are having trouble facing off against the opposing carry, a Butterfly would be the best bet. Wukong’s favorite situational pickups are those that give him even more on-hit effects to work with. Eye of Skadi gives you a huge boost in stats, and is valued for its magic immunity-piercing passive slow effect. Likewise, Diffusal Blade’s active slow helps you build Jingu stacks, while also stripping targets of their mana. Mjollnir synergizes supremely with Wukong’s Command, while also allowing you to protect yourself or your teammates with the Static Charge active ability. Silver Edge helps against pesky passive-reliant heroes like Bristleback and Slark, while also giving you a way to initiate or escape beyond Tree Dance and Primal Spring. And finally, the item that Wukong himself wields, Monkey King Bar. Against evasive enemies, you’ll definitely want to get this. There isn’t really one surefire way of using Monkey King’s abilities in combination, due to the fact that casting spells other than Primal Spring while Tree Dance is active doesn’t cause him to jump down from the tree. Thus, Wukong has a bit of freedom when it comes to which ability to initiate with, which will be largely determined by the situation at large and whether or not he has the Jingu Mastery buff on. That said, the most common rotation involves initiating with either Wukong’s Command or Primal Spring, then attacking one hero four times to activate the Jingu Mastery buff. Boundless Strike comes last, since it needs the Jingu Mastery buff in order to deal the most damage it possibly can. Don’t be afraid to use it early, though, if the enemy team has a channeling spell that needs to be interrupted or a combo that must be prevented at all costs. The best way to deal with Monkey King is to prevent him from getting his items in the first place. Wukong is borderline dead weight without farm, especially in the mid to late game. And since Tree Dance is his primary escape mechanism, picking heroes that disable it through damage (it goes on a three-second cooldown whenever Monkey King takes damage, like Blink Dagger) is always a good idea. Viper, Venomancer, and Disruptor are just a few choices that work well against him in this regard. Disruptor in particular provides vision over Wukong while Tree Dance is active, and the rest of his kit prevents escape either by silencing him or returning him from whence he came. Likewise, heroes that destroy trees with their own abilities are prime candidates for countering Wukong. Windranger can blast several trees down with Powershot, and Timbersaw’s entire arsenal of spells is built around clearing treelines. 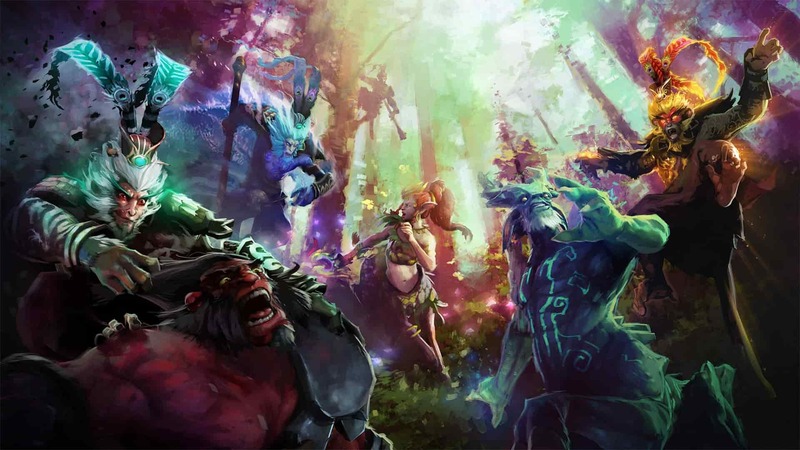 Beastmaster’s Wild Axes accomplishes the same thing, while Nature’s Prophet can turn the trees against Wukong through the use of Nature’s Call. Batrider can burn entire forests with Firefly, and capture Monkey King with Flaming Lasso. Displacing Monkey King while Wukong’s Command is active causes the ability to end prematurely, which is when abilities and items that do just that come in handy. Force Staff is a universal option for this—even for ranged carries as it builds into Hurricane Pike. Earth Spirit’s Boulder Smash can push Monkey King out a fair distance, and so can Keeper of the Light’s Blinding Light. Magnus’ Reverse Polarity immobilizes Wukong, thus allowing for an easy Skewer out of the Wukong’s Command ring. Pudge does the reverse, with Meat Hook snagging Monkey King out of the radius from a mile away.